Last week was a busy week, after keynoting the Nonprofit Solutions Conference in Kansas City, I facilitated a one-day workshop for the Center for Nonprofits on developing and measuring a sustainable integrated social media strategy. After the workshop in Ohio, one of the participants thanked me, saying that creating a strategy for integrated social media had been on their to do list after taking a workshop last Spring, but had never gotten around to doing it. She said the workshop gave her the time to get started working on it and was confident that she’d be putting it into practice immediately. During the long plane ride home (without wifi), I thought a lot about this question: How do you design a training so people learn something and are inspired to use it? A successful training is not about extreme content delivery or an opportunity for the workshop leader to show off how much they know about the topic. It’s more about giving participants a jump on applying it and guiding them so they can put it into practice as quickly as possible after the workshop. If you are designing and delivering training on any topic, here’s some things to think about to ensure that your participants have a transformative learning experience. More than one person from an organization should participate so the ideas can be transferred to the whole organization. Participants should be encouraged to bring more than one person. Since this isn’t always possible, it is important to incorporate opportunities for them to capture their learning so they can share it. 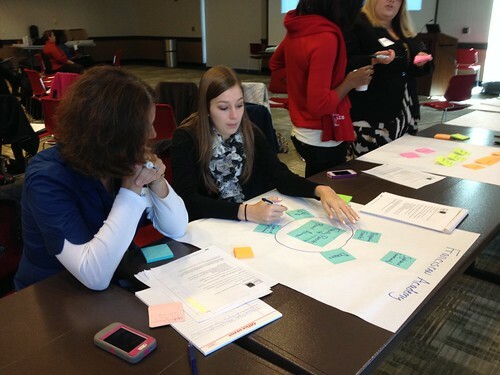 Workshop curriculum should include time for participants to synthesize what they learned into some “reporting out and up” takeaways to share with their organization. In my workshop design, I always include a “learning artifact” such as a “strategy poster” and time in the workshop for participants to present. Workshop content has to be practical about the amount of investment required to implement ideas – and always include some “low hanging fruit” or actionable steps that don’t require a huge amount of organizational change or monetary investment. That’s part of the reason why I developed the “Crawl, Walk, Run, Fly” framework because it gives participants practical, but strategic small steps. For the past twenty years that I’ve been doing training, no matter what I usually get a group of participants who are mixed levels of experience and capacity. So, you have to design for that. This takes a bit more effort than putting together a slide deck. The secret is in the structure and design of the small group exercises. And, as the facilitator, you have to be good at improvising and skilled at coaching some participants to adapt exercise so it meets their need. This means that you can’t be in the front of the room delivering content all the time! For example, I incorporate tactical and visual techniques for participants to use to do the exercises. Often this involves using materials such as sticky notes, poster sheets, and markers. I don’t always have a lot of participants who are eager to do it virtually, but when I do I can work with them to adapt the exercise. 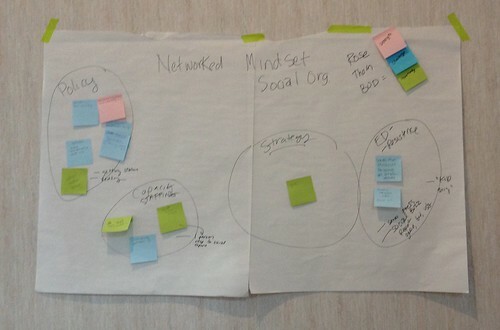 There are software programs like GroupZap and Listhings that allow participants to use “virtual sticky notes” to create a poster. By having the options available, participants can choose what works best for them so there are no barriers to learning. Most likely, there will be some content delivery you share during your workshop. It is important to evolve your presentation style so it is more interactive, engaging, and a lean forward experience. There are many ways to do this, but try to avoid the “Q/A of the Expert at the End,” and facilitate discussion that is more reflective. Encourage participants think about and share how they might apply the content – What challenges or opportunities exist? There are different methods for doing this, including share pairs, report outs, and way too many to share in this post. But, lately, I’ve been facilitating with sticky notes on the wall incorporating Human Centered Design principles. For one of the modules on organizational culture change, I asked participants to do an active listening exercise with sticky notes — jotting down notes in pink that they can implement, green that were opportunity, and blue that were a challenge. I facilitated a discussion using the sticky notes that ended up going much deeper than if I had just done a Q/A – ask the expert or even share pairs. It can be a little stressful incorporating new techniques into your practice because you have to do them a few times to learn the nuances of how they work. I was lucky enough to be a session facilitated by Peter Maher from Luma Institute who is an incredible teacher too – who was able to share some great tips based on his vast experience. If you doing training, you have to be a little fearless piloting new techniques or you will just do the same old stuff – you’ll get bored and your participants will also be bored. The Flipped Classroom is mindset that directs attention away from teachers and puts it squarely on the students and their learning. It’s being done in elementary, high schools, and colleges. While there is no one right way to use the technique, what would customarily be defined as homework (problem sets, essay writing, etc.) is done by students during class hours, with a teacher’s supervision and hands-on input; and what was once the core of the classroom experience (teacher lectures) is now absorbed at home via online resources. While it take some effort to apply flipping to a one-time workshop, you have to understand how the brain works to absorb information and apply it – it can be done in small ways. One method is to incorporate short interactive content delivery, followed by an exercise where participants work on applying the frameworks with coaching from the instructor. 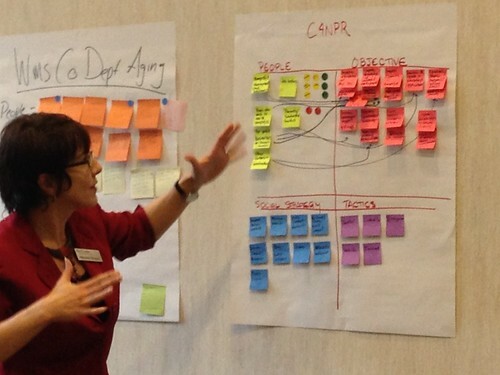 Then, the ultimate flip — the participants present what they worked on – in this case their integrated strategy. This also gives participants practice verbalizing what they learned, how they’ll apply, and an actual “product” they can bring back to their organization. 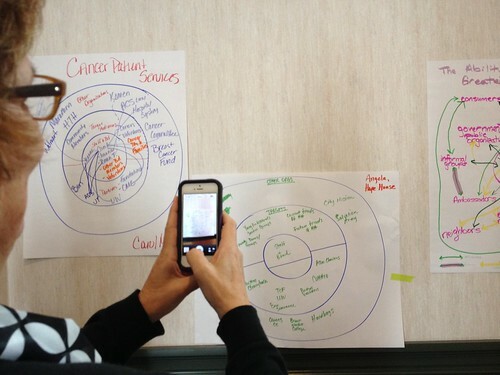 I also noticed participants using their mobile phones to capture the strategy posters and network maps. I asked a few why they were doing that — expecting a response about wanting to be able to share the map or poster in a powerpoint back at the office. One participant told me that that only two people from their organization could participate and wanted to get feedback from other staff. Another participant mentioned that there were several organizations who were their partners and the other maps gave them some ideas about potential collaborations. Through out the workshop, you need to incorporate quiet time for participants to focus and synthesize what they learned into some “reporting out and up” takeaways to share with their organization. I often use “think and writes” – a few minutes of silence where participants can consolidate their ideas into action steps after the workshop. Their reflection can go deeper if this is followed by a share a pair and a formal closing to the workshop where participants declare their intentions about one small step to implement next week. 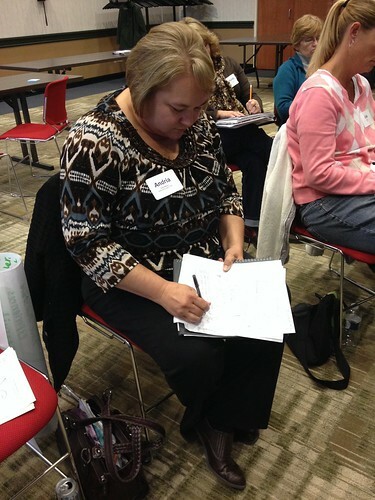 If you are designing and delivering training, how do you sign to get results? What was a recent training that you attended where you not only learned something, but shortly put it into practice? What inspired you about the way the training was designed? Really thought provoking post Beth. I must say, as a trainer, I always incorporate some time for trainees to consider barriers to implementing what they’ve learned, and how they might overcome them. It’s always interesting. As someone who just comes in for a day, I’m usually ignorant about the cultural barriers to a new way of working. And this is crucial – the training could be world class, but will count for nothing if the trainees can’t implement it for whatever reason! So your suggestion of more than one person attending is excellent! Great post, Beth! These hands-on takeaways have always been the most useful to me as a participant, and have always been the source of the most input when I’ve been the trainer. Fabulous fabulous! I just completed delivery/facilitation of an all-day hands-on workshop on using social media professionally. One of the big takeaways for me was that I didn’t leave enough time for hands-on, even though I was sure that I had plenty of it. 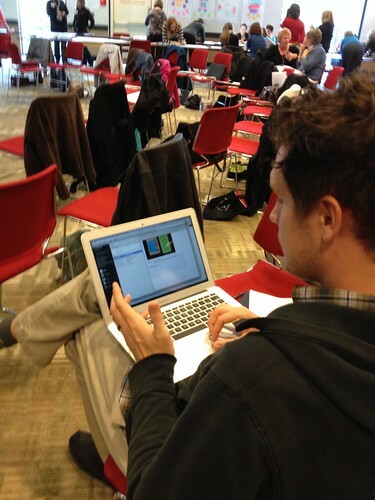 I wonder: is there a ratio or”rule of thumbs” for idea/explanation-to-hands on training that you use? As for the flipped classroom, I aspire to implement that idea with my social media strategy graduate class, and the rewards are manyfold for both the teacher and student. For my class, the students read materials ahead of time online, even discussing them in a discussion forum with directed questions. Once the students have had a chance to digest material online, what comes after is an in-person discussion richer and more interesting than anything that could be done in a combined presentation/discussion session (in my experience thus far). I learned so much from this blog post – thank you- and keep on blogging about training! Hope to write a book about this at some point. With regards to balancing content delivery with exercises. There isn’ a rule of thumb, but if you understand how the human brain pays attention to content delivery or lectures – you have about 7-10 minutes before people space out. The advice: take a minimalist approach to content — I do 10 minutes to 50 minutes. I think most of all it takes giving up your ego about your content. We’re all in invested in our content because we spend so much time creating it. But participants, esp adult learners don’t need to stand there and deliver content – they can apply it. As for the flipped classroom, been working this way for years – and agree that the discussion is much richer – esp if they have applied something. You have to carefully craft questions and facilitate pretty well. I love doing webinars with this approach – one session for the content then a follow up session for the discussion. Depending on the audience – and the content, I’v done a lot of weaving of discussion and content. One other thing to check Debra – sometimes it isn’t a ratio of time – content to exercise .. here’s a list of questions. 1) Do you have too much time on content in the whole time allotment to do the exercise? 2) Is the exercise too complicated or complex to complete in the time alloted? Have you broken it down? 4) Do participants know there is a time allotment to complete the exercise and are you keeping time for them? 5) Did your content give them enough or the right information to complete the exercise? 6) Is the exercise realistic to complete in a workshop like this? 7) If you put folks into small groups, did you do any social engineering to avoid getting stuck or help them complete them in the amount of time provided? 8) Where is the exercise placed on the flow of curriculum? Is it in the right place? Matt: What type of reflection exercise do you do? Is it throughout the workshop and at the end or just at the end? Do you have an example you can share? 1. I kept the “you have their attention for 10 minutes” idea in mind, and broke them out into an exercise much earlier, after 15 minutes. 2. “Do-able” and continuous learnings: the exercise was always supposed to be active learning, but I took the exercise to the next level in the second breakout, building on the first section of activity and learning. I’m giving a workshop next weekend with a colleague and posed the question to my co-presenter: how much of this can we scrap and deliver through actively facilitating in-workshop exercises. Your advice about checking the content delivery ego at the door is priceless. Thank you! On reflection exercises, I tend to do one at the end of a workshop. I don’t do it before that as I want to help trainees focus on the theory and not get distracted by the practicalities – they might be less creative when they start thinking about the difficulties in applying what they’re learning! It’s an open ended discussion involving the whole group. I ask what difficulties they could envisage applying what they’ve just learned. After that’s been discussed fully, we look at ways round those barriers. The group always has lots of ideas for solutions, and I offer mine where relevant too. I think it’s an important session – I want them to be able to apply what they’ve learned after all! First, words cannot express how bummed I was to be gone when you were in Kansas City. Truly, truly bummed. Thank you for this, though–as a college professor, I think there’s a lot here that applies to adult learning in any context, including academia. We use a hybrid course format (some class content delivered online, with fewer in-person sessions) that lends itself well to the ‘flipped’ model, but I do find that students and faculty are both somewhat resistant, sometimes, to the shift in the power dynamic that that requires (and triggers–one of the reasons I like it!). Application is harder, sometimes, with students, who aren’t usually in positions outside of class where they have authority to immediately put new learning into practice, but I still think application is key, so the onus is on me to design so that they can get there. This is good stuff. The less I talk as a trainer and the more group participants participate (often in front of the group — or in a small group), the better the training is for them. The more practice they have the better. Thanks for this. Great reading. I find that it is very important to think through the directions that will guide learners into their activity. It can take a couple of tries (failures?) to find the words that work, that make things clear and not too wordy. Otherwise, people sit in groups confused or spend time being not clear on the outcome. What made sense to me in my preparations can be very unclear to the learners sometimes.